America is a nation thoroughly embroiled in scandals these days. Harvey Weinstein, Larry Nassar, the #MeToo movement, and more. But thousands of years earlier there was another talk-of-the-town scandal that involved one of God’s prophets, a man named Hosea. In what must have been a shock to Hosea, God commands Hosea to marry a woman named Gomer who was a known adulteress. Through Hosea’s experience, God was going to act out a real-life parable that illustrated his relationship with and his love for Israel. Gomer bears three children. Yet it seems that at least some of them were fathered not by Hosea, but by one or more of Gomer’s lovers. Yet Hosea doesn’t divorce her or condemn her to death (Lev. 20:10). He continues to take her back. Then, for a time, she left Hosea completely for another man (3:1), likely also living as a prostitute (3:3). Gomer was an unfaithful wife who had many lovers. Imagine the town gossip this stirred up. Imagine all the people questioning Hosea, pestering and bothering him for doing what no sane, rational person would ever do: Love a serial adulteress. Imagine all the degrading jokes Hosea may’ve endured at the hands of his community. And yet, in this scandal, God was trying to teach Israel—and us—something about his love. 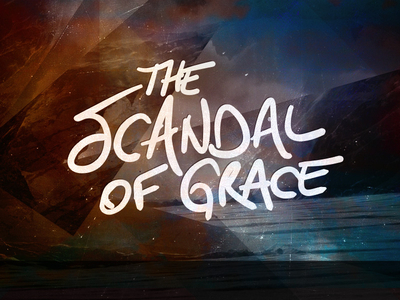 “In Hosea, the scandal of grace became an actual, talk-of-the-town scandal. What goes through a man’s mind when his wife treats him as Gomer treated Hosea? He wanted to kill her, he wanted to forgive her. He wanted divorce, he wanted reconciliation. She shamed him, she melted him. Absurdly, against all odds, the irresistible power of love won out. Hosea the cuckold, joke of the community, welcomed his wife back home. What a comforting message God shares with us through the bitter life experience of the prophet Hosea. He continues to love and take back those who are unfaithful to him. In this real-life parable, we see that God is gracious. That word grace refers to a special kind of love that is not earned or deserved. As retired Pastor and Professor Daniel Deutschlander wrote: “Grace is a unique kind of love that God alone has. It is not a quantity to be measured; for nothing in God is capable of measure or limitation. It is rather an attitude, a disposition in God, by which he loves with no other reason for it than God himself. God loves because that is his nature, that is his essence. God loves, not because the object is loveable but because he is loving.” (“Grace Abounds” p. 111) And because God is gracious, there is nothing we can do to make God love us more, nor is there anything we can do to make God love us less. We have his love, regardless of what we do and don’t do. He never drives away those who come to him with a broken and contrite heart. And that is what makes grace the best scandal there ever was.